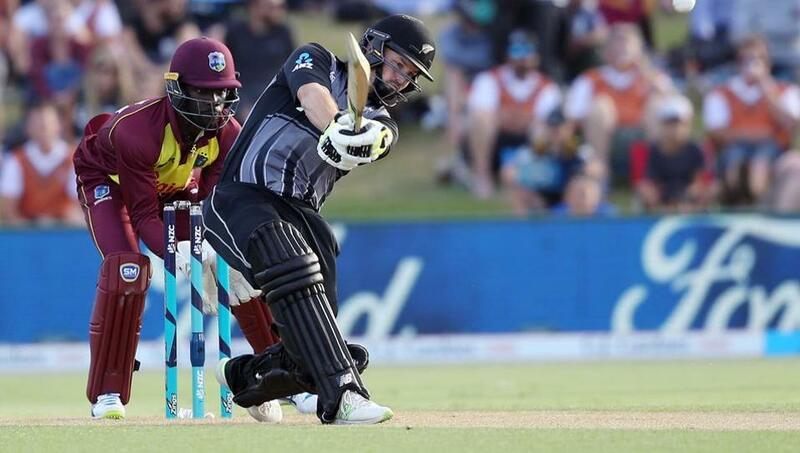 New Zealand won the toss and made the surprising decision to bat first in the third Twenty20 international which began Wednesday under the threat of rain. The Black Caps lead the three-match series 1-0 after winning the first match by 47 runs and after the second match was washed out at the same venue. It was the last chance for the West Indies to win a match in New Zealand this summer after losing the two-test series 2-0 and the three-match one-day international series 3-0. Swing bowler Trent Boult returned to the New Zealand lineup in place of Seth Rance. The West Indies made two changes, naming Jerome Taylor in place of Kesrick Williams and medium pacer Rayad Emrit to make his T20 international debut at the age of 36. New Zealand: Martin Guptill, Colin Munro, Glenn Phillips, Kane Williamson (captain), Tom Bruce, Mitchell Santner, Anaru Kitchen, Doug Bracewell, Tim Southee, Ish Sodhi, Trent Boult. West Indies: Chris Gayle, Chadwick Walton, Andre Fletcher, Shai Hope, Shimron Hetmyer, Rovman Powell, Carlos Brathwaite (captain), Ashley Nurse, Jerome Taylor Rayad Emrit, Samuel Badree. Umpires: Wayne Knights and Shaun Haig, New Zealand. TV umpire: Chris Brown, New Zealand. Match referee: Andy Pycroft, Zimbabwe.